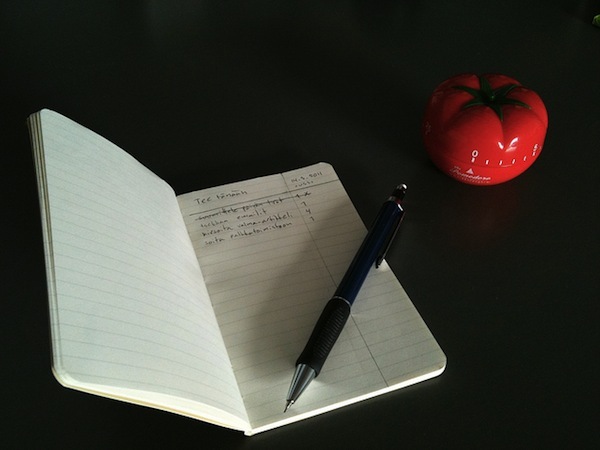 The tools that you need for the Pomodoro Technique are a pen, a kitchen timer or pomodoro app for your smartphone and 3 sheets of paper. The To Do Today sheet will contain all your tasks that you planned for today. You create a new one every day. The Activity Inventory sheet will contain an unsorted list of your upcoming tasks and goals in the near future. You use the same Activity Inventory sheet day after day. You can add new tasks or remove completed ones from it. The Records sheet is where you keep the analysis that you had when using this technique. For example you can write how many times you were interrupted. You start the day by planning the most important tasks from your Activity Inventory sheet. Then you write them in a list on your To Do Today sheet. Don’t forget to prioritize your tasklist. You wind up the timer or start your pomodoro smartphone app timer for 25 minutes. During every 25-minute timebox also called a Pomodoro you record the number of time you were interrupted. After you finish the 25 minutes you take a short break of 5 minutes. After finishing 4 Pomodoro you take a long break (usually 30 minutes). At the end of the day you record your daily analysis and observation on the Records sheet. This sheet will contain for example the number of interruptions you had during the day and also how many pomodoro you needed to finish a specific task. You can make time your friend with the pomodoro technique and beat laziness and procrastination.